It is a myth that you have to take out expensive student loans to attend college. It may take a few different sources to pay for classes, but it is possible to graduate debt free from every level of college. I had the misfortune of working for Nelnet for two (2) years in the call center. In future blogs I’ll write about how to navigate the federal loan servicers. While I was there I was at the front line of the federal student loan crisis, and I took 60-90 calls a day dealing with the misery that student loans cause. Looking back over all the calls I handled, I am eternally grateful that my parents instilled in me a debt-free ethos. Using what my parents taught me, I was able to earn a A.A., B.A. and M.A. and teaching license debt free. In 2001 I had just graduated from high school and I wanted to take a year off to find myself. Dad looked at me and said ” Hell No”. So I went to a local community college for my 2 year associates of arts degree. Community colleges are a great way to start if you’re not sure about what you want to do for a carrier. They are also more affordable then 4 year colleges. Having an A.A. or A.S. degree will also make it easier to transfer to a 4 year college. The core classes required at all colleges can be covered by community colleges, so you don’t have to spend more at a 4 year institution. I’d recommend a community college first to help instill the study skills needed to function at a 4 year college. While I was at community college, I signed up for work study program in the bookstore (more on book stores in the future). I also worked for 6 months with the education program, where I supervised after school programs at a local middle school. At other colleges I worked in the disability service department as well as another book store. Work study jobs are a great option because the work schedules are flexible with your school schedule. Work study also gives you job experience for your resume. In the book store I did get a textbook discount (a whole 10% off, but a discount is a discount) As a worker I was also eligible to contribute to PERA, which is Colorado’s employee retirement system. The paycheck I earned I could pay for classes or save for myself. Every college has a handful of alumni and local scholarships that are available in the financial aid office. The applications are usually hidden among the stack of flyers for school services in the admin or financial aid office. Most will require that you file for FAFSA. Do not pay for a scholarship search, because they are just advertisement services. Look also at any clubs or groups you belong to in order to see if they have any hidden scholarships. Many social organizations like Scouting, hobby clubs, and religious organizations will have their own scholarships available. Yes there is a joke about scholarships for being left handed, but there are plenty of other oddball scholarships available. Debt free college can be done entirely with scholarships if you are prepared to do the leg work on applications. Scholarships can be in any amount and have their own strings, but any time someone wants to give a scholarship you should take it. I had one $500 scholarship just for writing music reviews for the student news paper; and for that I had to fill out a 1 page application. $500 covered a class and half of another class at community college. Another scholarship from 2003-2005 was a full ride to a 4 year college that I earned for working as a Boy Scout camp councilor. For that I had to work at the camp during the summer and reapply every year. The application was more extensive for that scholarship, and I also was interviewed for it. But the two years covered an extensive amount of my B.A. degree, dorm housing and fees. When the full ride scholarship ended for me after 2 years, I transferred to another 4 year college to finish my B.A. There I was finishing of my degree and working on also earning my science teacher license. This time I was back in the college bookstore for work study. Along with family support, I was able to finish my B.A. and teachers licenses. After graduation I was hired for my first teaching positing in rural Colorado. I wanted to continue for my M.A., so I started taking 1-2 online classes a semester while I was teaching full time. Mentally it was draining taking the classes and teaching, but I figured any progress forward is better then none. By only taking 1-2 classes, I was also able to cash flow and pay for them out of pocket. With this slower pace, it did take about 3 years to complete my M.A., but paying out of pocket was the best option I had given where I was teaching. When the first teaching position ended, I came back to Denver and attended University part time. While going to classes I also worked for a private education company teaching after school programs. Between that and AmeriCorps I was able to complete my M.A. Working at DMNS for the AmeriCorps program. AmeriCoprs is a national service organization (think PeaceCorps for the USA). To complete the last year of Master’s study, I volunteered for a 900 hr term of service with AmeriCorps. 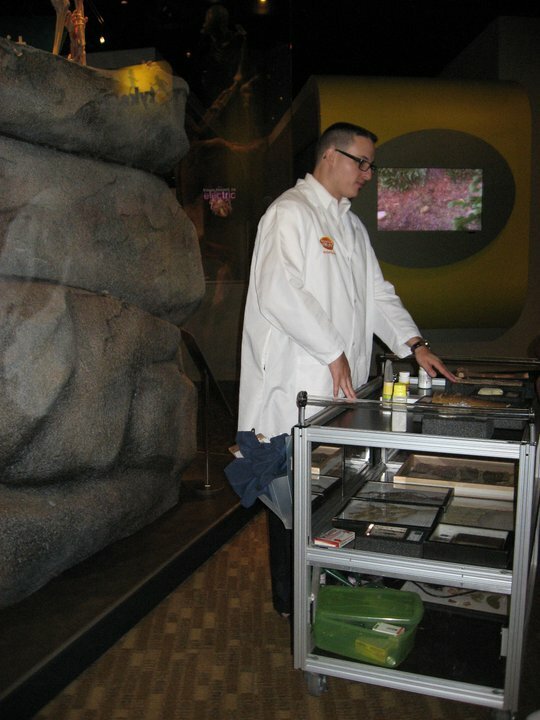 For my public service I volunteered at Denver Museum of Nature and Science, where I helped in the Body Worlds exhibit. While it was a volunteer position, the resume experience was invaluable to my teaching career. I volunteered for the mornings and weekends, and was able to attend class in the afternoons. Yes, Debt Free College is Possible! If you are willing to be a it creative, there are many paths you can take to earn your degrees debt free. The path I took provided many other outside benefits, from work experience to state pension plans and income. If you are planing to go to college, I encourage you to be creative in finding ways to go to college debt free. I also recommend Dave Ramsey if you want more ideas for debt free living. 3D-PT plans on publishing other blogs about education issues and debt free living, along with 3D printing. Let me know in the comments what you would like me to cover in the future.